It may seem odd that the likes of Nikon have come late to the action camera territory, but better late than never and now with the KeyMission 80, the company is hitting the VR-ready video market. The 360 4K market isn’t overflowing with competitors as yet, so we will see if the long-standing camera makers can make an impact into this territory. The KeyMission 360 is aimed squarely at the higher end of the 360 video market, utilizing just one body in a compact design, that’s if you consider it’s just one unit rather than multiple bodies like from other manufacturers. The KeyMission 360 has two large wide-angle lenses pointing in opposite directions to cover the whole field of view. I get the reasoning for only two lenses on one camera body to cut down on size and weight, but going back to my 360 tour days, 2 fisheye views of a scene rarely did the job, unless it was a quick and dirty shot. It was usually six images needed to get any amount of quality from a 360 view. 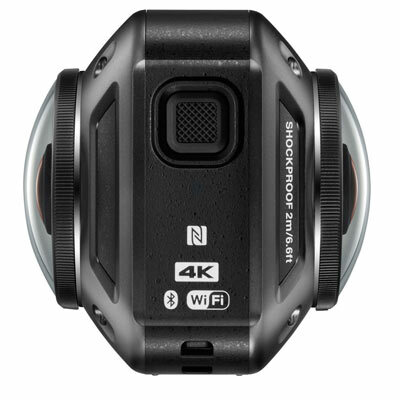 Containing action cam qualities the KeyMission 360 has 2 x 21.14 MP 1/2.3-in. type CMOS sensors with 2 NIKKOR ultra-wide-angle lenses. The focal length of each lens is 1.6mm, the equivalent of 8.2mm lens in a 35mm format, with the widest aperture going to f/2. The focus range goes from approximately 1 ft. to infinity and an ISO range of 100–1600. Resolution for video comes in at 2160/24p or 960/30p, 640/120p and 320/240p. Carrying on the action cam qualities, the camera is dustproof, waterproof down to 30m without a housing, shockproof for drops up to 2m and freezeproof down to -10°C. The camera comes with a set of replacement lens covers for using underwater and a silicon sleeve for protection. 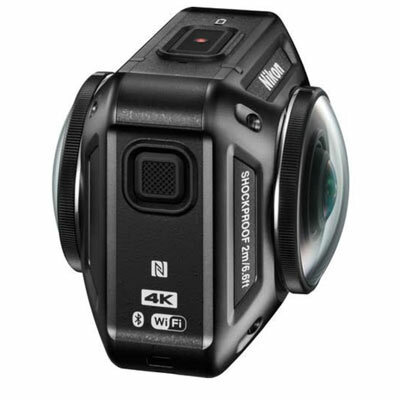 As with the rest of the action cam market, there are plenty of accessories available for the camera ranging from rechargeable batteries, a remote control, mounts for many applications from surfboards to wristbands, backpacks, and a handy grip. Controls on the camera are quite straightforward with a large video record button, battery level indicator and recording LED on the top of the camera. On the side is a button for taking still images and on the other side under a waterproof cover, a Micro USB port, Micro HDMI output, microSD slot and battery compartment. The buttons for recording are a little too touch sensitive and even with the camera turned off, it can start recording like many other units, but in this case, it can happen quite often accidentally. There is an included ball-head at the bottom of the camera with a standard tripod mount at the base of the camera. Battery life will give you about an hour of video recording at top resolution, taking a good few hours to recharge via the Micro USB cable. The battery indicator will glow orange when its rundown, but with no indication of how much charge is left. A camera such as the KeyMission 360 needs reliable software if you’re going to get the most out of it. A SnapBridge 360 app is available for both Android and iOS linking via Bluetooth LE and Wi-Fi. The app allows continuous connection with the camera and both lenses, along with the ability to transfer images and change settings on the camera. Pairing can be problematic, so a flip to Airplane mode will allow you to use the camera straightaway. Nikon’s desktop KeyMission Utility can be used for video editing, but it’s not the greatest. At least uploading to YouTube or Facebook is pretty seamless. All settings are controlled through the app. As the camera has no setting controls itself, you’re a hundred percent reliant on the app working consistently, which is not always the case. With a resolution of 3,840 x 2,160, you would expect a higher frame rate than 24fps by today’s standards. Video footage can be soft looking at times and noisy looking in low light, but at least it does a great job in the stitching process of video. The odd process comes with still images. you would expect the two camera views to be simply stitched together, but instead, the front camera is a square image placed centrally and the rear camera is vertically split to either side. This means that the front camera needs to always be pointing at your most important subject area, kind of weird for a 360 camera. The whole process just seems a bit more convoluted than it needs to be. The resulting stitched images are reasonable, but you have to get used to the quirks of the system to gain consistent results. The Kodak Pixpro SP360 4K is a straight contender to the KeyMission 360, but the Kodak is really a two camera set up. The Kodak can record UHD 4K at 30 fps and and 720p video up to 120 fps for hi-speed footage. Prices are now also comparable, with a price drop on the Kodak making it a tempting contender. With Nikon’s reputation in the camera market, the KeyMission 360 feels a little disappointing. Video quality is just okay and the way the camera stitches still images could be approached differently. The overly sensitive record button and accidental recording don’t help, which means that although it does what it says on the tin, the camera doesn’t perform anywhere near as expected. This means that unless you’ve got a certain application for this camera, the competition can produce better for the money. The camera feels like a first version, which means if Nikon pushed ahead with the camera and addressed its flaws, it could turn into a sturdy, usable device in the future. We will just have to wait for V2.